The following is a list of steps used by salespeople to create a new presell order using eoMobileCF. 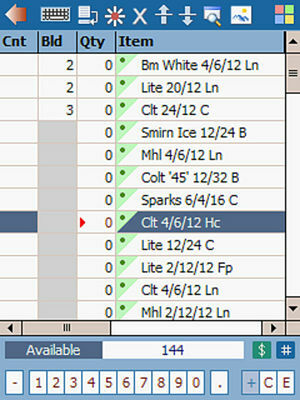 For information on how to edit an already saved order, see Salesperson Handheld - Editing Invoices. For a video tutorial, see EoMobile Video Tutorial - Servicing a Customer (Presell Order for Salespeople). Product promotions are also shown in creating an order. For more information on promotions on the handheld, see Promotions on Mobile Devices. It is possible to Hold an order by taping the hyperlink Hold. This ability, will not remove zero-quantity items on the invoice; but instead leave these items so that the user may return to the invoice and complete it at a later time. Held orders will show a "H" on the Run Route Screen, which can be tapped to re-open the order. In October 2009, changes were made to allow the upload-only operation to be performed even if there are orders on hold. Tapping on the $ at the bottom of the invoice screen will show three values for the selected product. The shown three values are based on the company's settings. It is possible to "Sort by Item Description" and "Sort by Item Number" for the products in the invoice. Even if the invoice is sorted, when you add a new item that item is still always added after the currently selected item. Note lines will be listed on the top of the list. Additionally, it is possible to choose which columns are displayed on the screen. 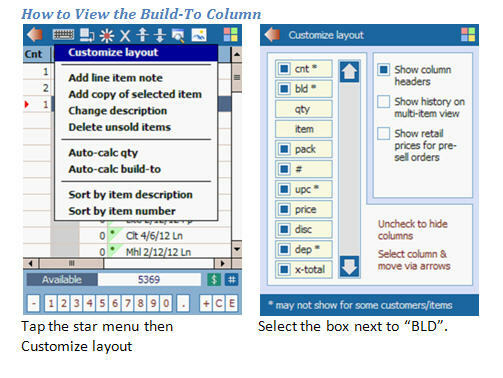 To change the columns, select the "Star" menu and then Customize Layout. 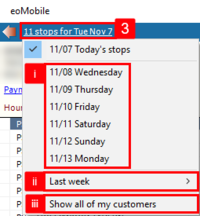 Select or de-select the boxes to choose which columns or information to show. From the main screen, tap Run Route. Customers scheduled to be visited today will be listed by default. To view the stops for a different date, click the hyperlink ## Stops For DATE. View any notes and tap Ok. The Invoice Main screen will appear. a. To add a order type, select the hyperlink. Select the changes, and then click the hyperlink Use It. b. To add the PO Number, select the hyperlink. Type the changes, and then click the hyperlink Use It. c. To add who the order was placed with, select the hyperlink. Type the changes, and then click the hyperlink Use It. d. The delivery information including the delivery date and driver is set up at the backend (eoStar). To change the delivery information, select the hyperlink and make the changes. Then tap the hyperlink Use It. e. To make the customer taxable or to create a special delivery, mark the boxes. Tap the To Order Entry Screen button. This screen contains all the products and quantities in the order. a. To add a product, either search using the search button or type in the product number and tap +. Type in the quantity. For more information on this functionality, see EoMobileCF Find/Add Items. b. To view the totals while in invoice view, tap the column headers to bring up a total summary. c. To turn on or off the on-screen keyboard, tap the Keyboard button. d. There are two view types available on the Order Entry Screen. They are Single-line view and Invoice-Based view. i. To switch to the single-line view tap the Single-Line View button. ii. To switch to the invoice-based view, tap the Invoice-Based View button. Note: These buttons toggle back and forth based on the view you are currently in. i. To customize the layout of the single-line or the invoice-based view, tap Customize Layout. ii. To add a line item note for the selected item, tap Add Line Item Note. Type in the note. iii. To add a copy of the selected item to the invoice, tap Add Copy of Selected Item. iv. To change the description of the selected item, tap Change description. v. By selecting Delete Unsold Items, any zero quantity orders in the invoice will be deleted. vi. Auto-Bump Scanned Items is added with the AutoBump Plugin. f. Use the Delete button, to delete any selected items. g. On the invoiced-based view, it is possible to move items up and down the order invoice by tapping the Move Up or Move Down buttons. h. When finished making changes to the order, tap the Back button. To record a driver's note, tap the Notes button. Type in the changes, and click the hyperlink Use It. To set the manual delivery charge, tap the Modify Delivery Charges button. Type in the changes, and click the hyperlink Use It. To view the history of the clients orders, tap the To Order History Screen button. To view the totals for the order, tap the Order Summary button to go to the Order Summary screen. When finished making changes, tap the hyperlink Save. This will bring you back to the Run Route Screen. Besides the customer record, there will now be a dot showing that that customer has been serviced. With the handheld devices, special deliveries or orders can be created. 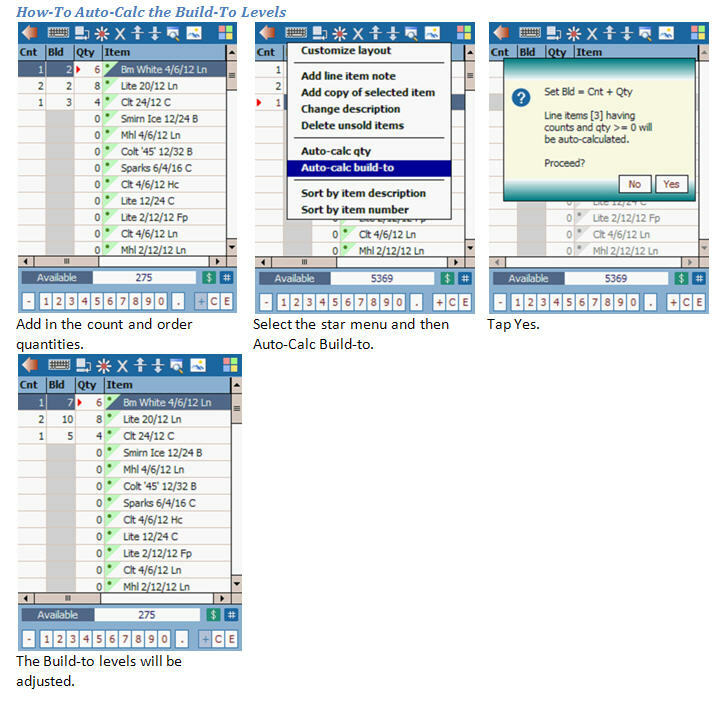 When creating special deliveries on the handheld, it is possible to assign a specific driver; however, it is also possible to assign a driver for an order in eoStar using the Truck Assignment. 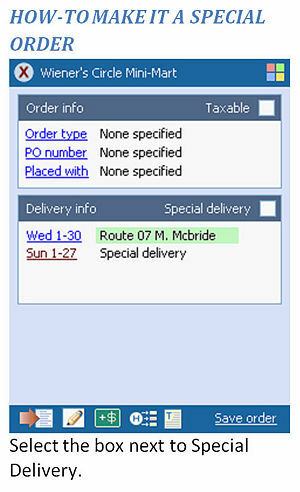 Hot Shot orders can also be created using the mobile devices. Special deliveries are handled the same as regular deliveries for the drivers within eoMobileCF. If the customer has an “Alternate delivery driver” then that driver will be selected by default when checking “Special delivery”. However, if the customer has no alternate driver, then the system will use the the customer's assigned warehouse's “Default off-day delivery driver”. Additionally, the driver can be left unassigned. This will put the order into Order Tracker without a driver assigned. To then assign a driver, open the order and assign it or dispatch it using the Delivery Dispatch. Select the customer off the list and tap the hyperlink Service. To create a special delivery, mark the box. By marking this box, it is possible to choose the specific driver to deliver the order. This page outlines the items that are printed on the Handheld Invoices. We download “X” number of days of sales history for each customer (“X” is set on the "Download ### Days of Sales History" option on the File>Database Administration>Configure handheld panel screen for up to 365 days, but can be limited for particular customers with an override ("# of days of handheld sales history") available via the customer’s More panel). item is sold only via allocation and customer has no such. Additionally if there are active product classes and the seller has one or more product class assignments for the customer, then items are filtered accordingly … i.e. if salesperson RED BULL only, then only RED BULL products will be candidates. Note that if there are no active product classes, or, for some reason the salesperson has no assigned product classes, then there is no filtering in this regard. Also note that the legacy handheld also took truck product class restrictions into account (dependent on the truck of the driver selected to deliver the order). This is a non-issue now since we automatically partition orders among drivers based on possible truck restrictions. One other tidbit regarding “what items are added” … if the customer has a standing order, and some items on that order are not within the “X” days of sales history, they also become candidates for being added to the invoice (subject to the same filtering described above). If the customer being serviced is using (or being forced to use) build-to lists, then once the pre-filtered list of items has been compiled, those items are sequenced according to the ordering of said build-to list. Note that just because an item appears on a customer’s build-to list does not mean it will be pre-loaded into the invoice … some items may be filtered via the mechanism described above. Also note that the new HH and Tablet both allow the user to modify (re-arrange, extend, etc.) a customer’s build-to list … if the user has done this, then the modified list is used for sequencing. If the customer is not using build-to lists, but is using a shelf sequence, then the pre-filtered items are ordered according to the shelf sequence. If the customer is not using build-to lists, and hasn’t been assigned a shelf sequence, and there’s a stored procedure in the database called “GetItemDeliverySequences” used for sequencing based on any created procedure. The stored procedure is added through a script created by Rutherford and may be edited to create any picklists, invoices, and/or anything that gets printed out from a handheld to print in any order deemed fit at the point of setup. This may include alphabetically or numerically. If the user requires the invoice to be printed in a different manner and the build-to and shelf sequences to be maintained separately, this stored procedure “GetItemDeliverySequences” can be used in this way. If none of the above is used to sequence, then there is no particular ordering that you can depend on. Note: It is quite possible that a build-to list or shelf sequence does not list all of the items contained within “X” days of sales history (some “standing order” items may also be unlisted). Once items having a determined sequence have been processed, any “extras” are handled. If an “extra” has a related alt-pack item already on the invoice, then the extra will be inserted into the invoice after that related item. If the “extra” has no related alt-pack, then it is simply tacked onto the end of the invoice. Added with the Build-to Plugin, the build-to levels are setup in the backend system through the Customer Records Build-To Panel. These levels may be edited through the pre-sell screen on the Salesperson handheld. The Build-to plugin saves a pre-seller a considerable amount of time while entering orders using a handheld. Within eoStar, desired inventory quantities can be entered for each product. When a pre-seller enters a count for a customer via their handheld, the appropriate field will suggest an order quantity by using the build-to value that was entered for the product. 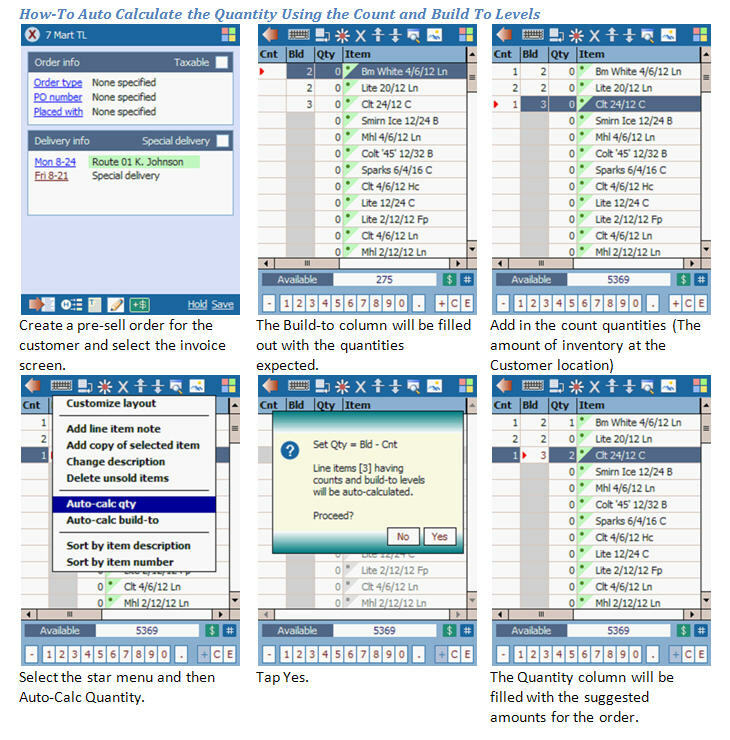 For example, if the build-to value for product # 8764 is 5 and the customer has a count of 3, then the quantity field will be populated with a suggested order quantity of 2 when the Auto-Calc QTY menu option is selected. The suggested order quantity can be overridden. Additionally, it is possible to edit the build-to levels. For example, if the count for product # 8764 is 3, and the quantity is 4, then the build-to level may be changed to 7 when the Auto-Calc Build-To menu option is selected. With the creation of build-to levels in the backend, the build to column will be available to be viewed instantly on the handheld. To view this column, tap the star menu, and then Customize layout. Select the box labeled BLD. From the Pre-Sell order screen, tap the Star Menu. Select the box next to "BLD". From the Pre-Sell Order Screen, tap the Invoice button. Add in the Count amount. Tap the Star Menu and then Auto-Calc QTY. Tap the Star Menu and then Auto-Calc Build-To. This page outlines how to show, hide, and edit the Retail Prices on the Pre-Sell handheld. This information is also available for Download Here. Retail price lists can be created in the backend system and then attached to the customer through the Records>Customer>Records Retail Prices Panel; however, sometimes the selected customer may not have any retail prices populated in the column because a Retail Price List is not assigned to them. As such, Retail prices can also be added and edited during a Pre-sell order. The edits are then sent to the backend system during a full sync and populate the Override column in Records>Customer>Records Retail Prices Panel. During the next order for the customer, the new retail prices will be shown. Pre-sell Users can only edit the retail prices if the permission “May Edit Retail Prices on Mobile Devices” on the Records>Employee>Records Permissions Panel and the checkbox “Allow Mobile Device Users To Maintain Retail Prices For This Customer” on the Records>Customer>Records Retail Prices Panel is checked. Previously, the retail prices column was not color coded. Now, if the price is an overridden, it is displayed in red. If it is a price from a retail price list (not overridden) it is displayed in green. Also, if there is a retail listed price and the user clears the override, then the default list price will now display. In December 2009, changes were made to add a retail prices override screen. For more information, see Handheld - Retail Prices. The retail prices on eoTablet are populated the same way as eoMobile. To show the Retail prices, from the order entry screen tap Columns and Show Retail Prices. This page was last modified on 26 January 2018, at 10:56.